From Riyadh to Jeddah is an hour and a half by plane. By car it’s a full day’s journey. Travelling by camel as the ancient Nabateans did would take a couple of weeks. We flew, and as soon as we stepped off the plane we noticed the humidity, so very, very different from Riyadh. 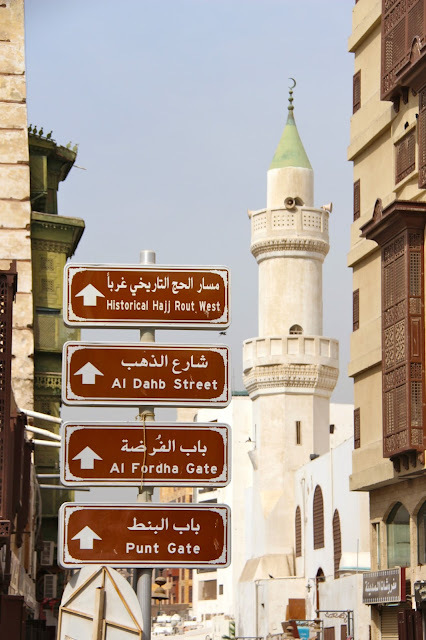 Jeddah's a port on the Red Sea and is believed to have been founded as a fishing village in 522 BC by the Quda’a tribe. This nomadic people travelled from Yemen, choosing eventually to settle in the Makkah region of Arabia. 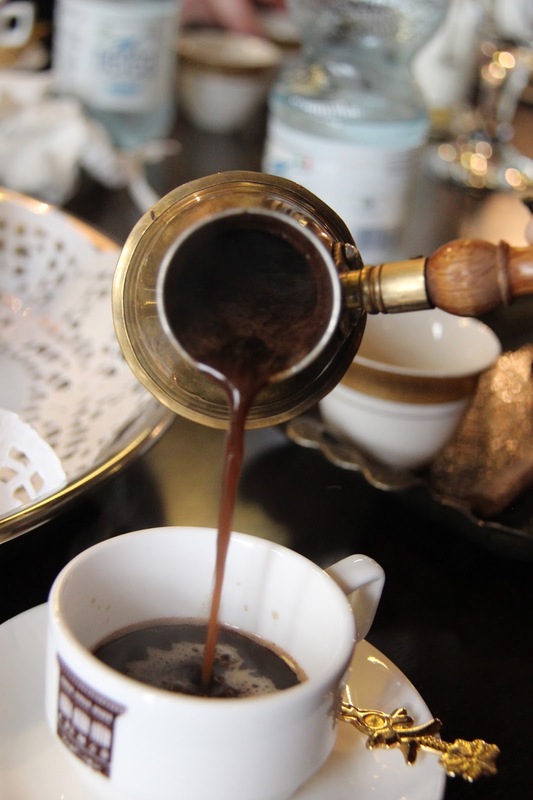 In the first century AD it became a post on the Nabatean trade route. Camel caravans from Yemen would stop at Madain Salah and then Jeddah, laden with spices, frankincense and myrrh. The derivation of Jeddah is Jaddah, which is Arabic for grandmother. 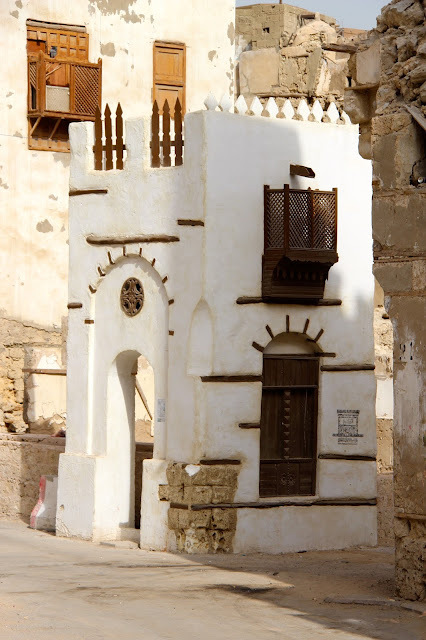 The tomb of the Biblical Eve, the grandmother of everyone, is meant to lie in an unmarked grave in a cemetery in Al Balad, Jeddah’s old city. So many stories and so much colour. Nowadays Jeddah’s the largest city in Makkah province and the entry point for overseas pilgrims travelling to Mecca and Medina, Islam’s two holiest cities. Waiting for our flight at Riyadh airport, we couldn't help but notice the distinctively clad pilgrims on their way to Mecca to perform Umrah. Umrah is a pilgrimage to Mecca that, unlike Haj, can be undertaken at any time of the year. Just as a word of explanation, every Muslim is expected to perform Haj at least once in his lifetime. The Haj pilgrimage to Mecca takes place after Ramadan and before second Eid. At such times Jeddah airport is literally swamped by multitudes of visiting pilgrims. History aside, it was our early morning visit to the UNESCO Heritage site of Al Balad, Jeddah’s old city, that was the highlight of our Jeddah visit. We began at the Eastern Gate, standing in the still sleepy street against a backdrop of teetering high storied houses and listened as our guide set the scene. The distinctive house frontages, mashrabaiat and rawashaan, he said, dated back to pre-Islamic times. Sadly many of these are dilapidated and badly in need of repair. 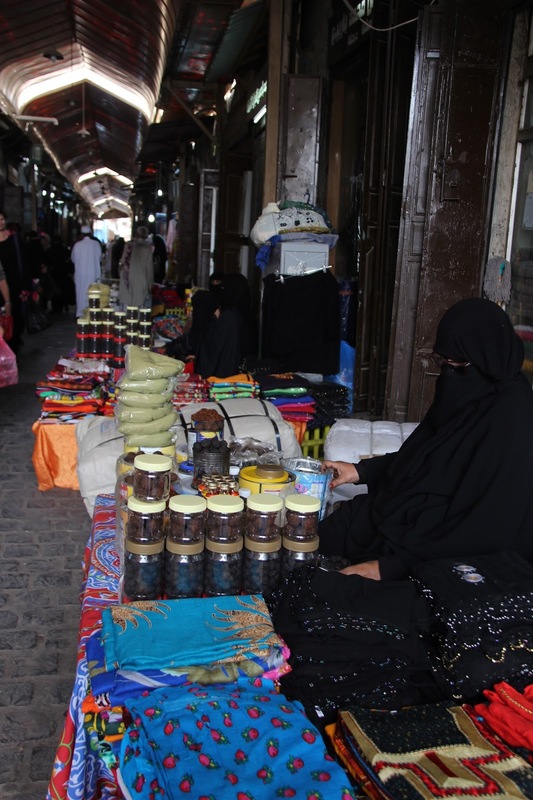 At the heart of Al Balad is Souk Al- Alawi. 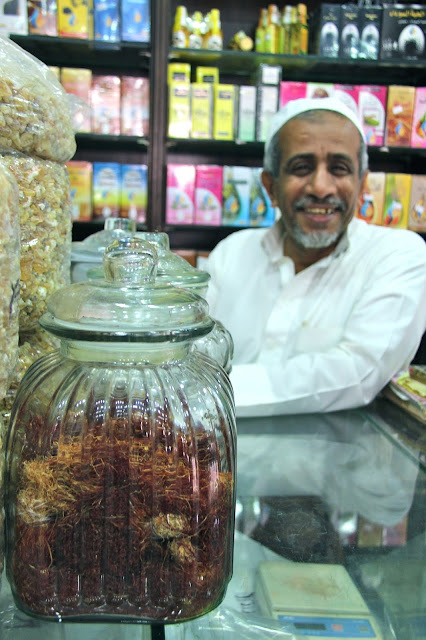 Here we explored shops selling frankincense, saffron and a multitude of other interesting dried spices.I must admit I love the colour and smell of places like these, and the array of merchandise that is so rich in tradition and history. There’s always something new to be seen that sets me wondering. 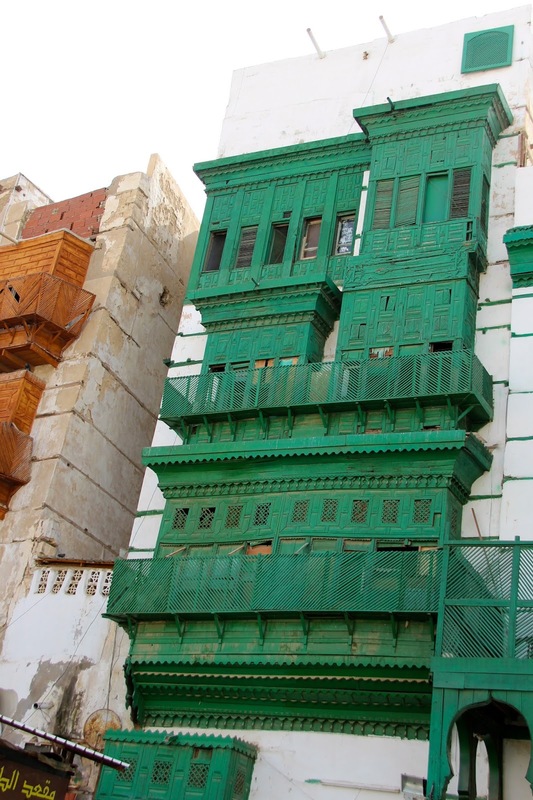 Al Shafei mosque is central to Al Balad and one of Jeddah’s oldest mosques. We saw the minaret before we saw the newly renovated mosque. 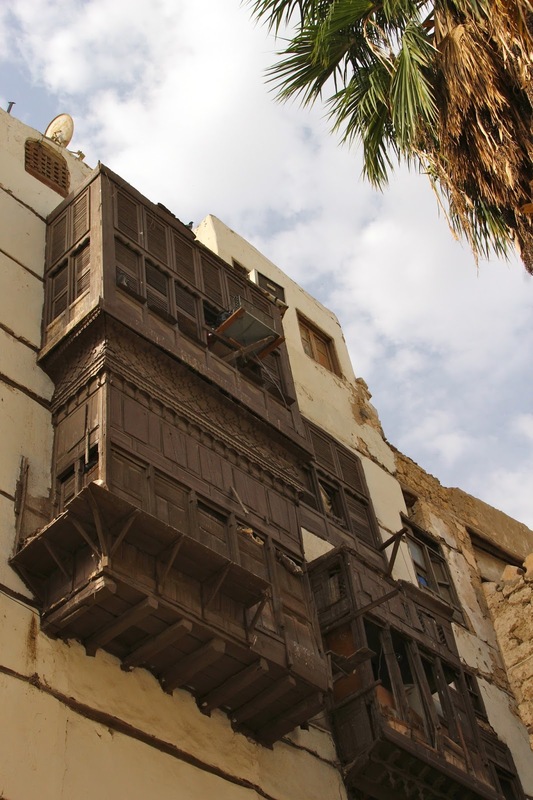 We would have liked to explore Al Naseef House, a former house of one of Jeddah’s main trading families, and now a museum. When we arrived it was open, but unfortunately not for us. Something else was on our guide explained. I think though, that we were just as happy prowling the streets, catching glimpses of every day life and generally savouring the atmosphere. 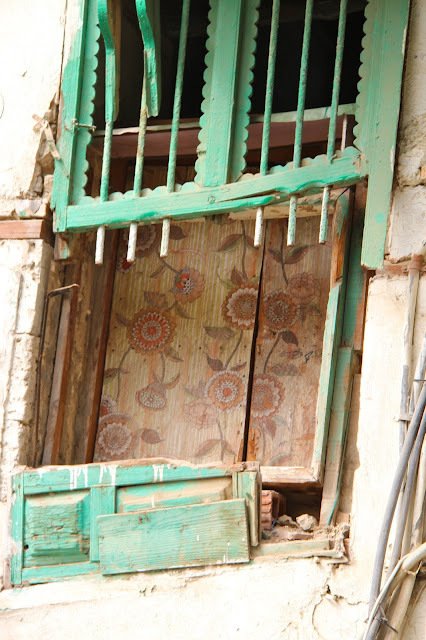 One scrawny cat reclining among building debris, bread being baked for early streetside breakfasts, shops opening and everywhere Jeddah’s distinctive architecture and colours, bright green, turquoise and ochre. At 10.30 we reached Café Magad. 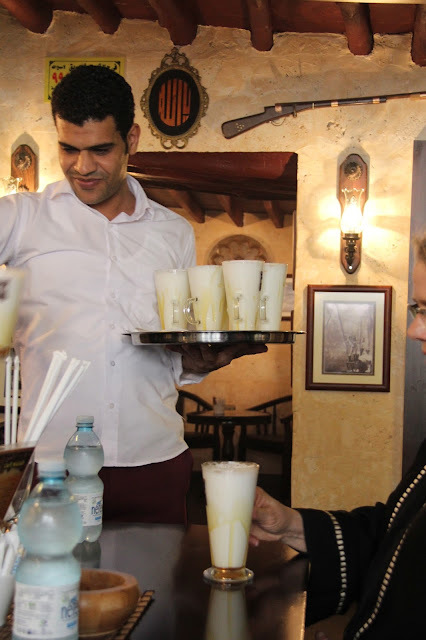 We were happy to sit for a while, soak up the eclectic atmosphere and enjoy traditional Arabic hospitality. Dates, Arabic coffee and something new, a honeyed yoghurt drink, thareeb. All of it just delicious. Then back outside and a final walk through the Bedouin souk towards the Western Gate. 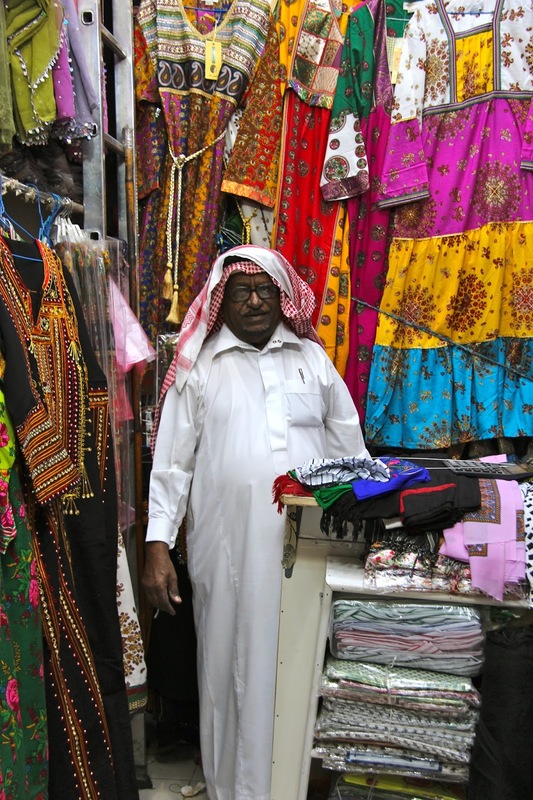 Here brightly coloured fabrics and clothing stopped us in our tracks. Porters waited hopefully for us to pile merchandise onto their empty trolleys, but time was short and against a background of our guide’s “Yalla. 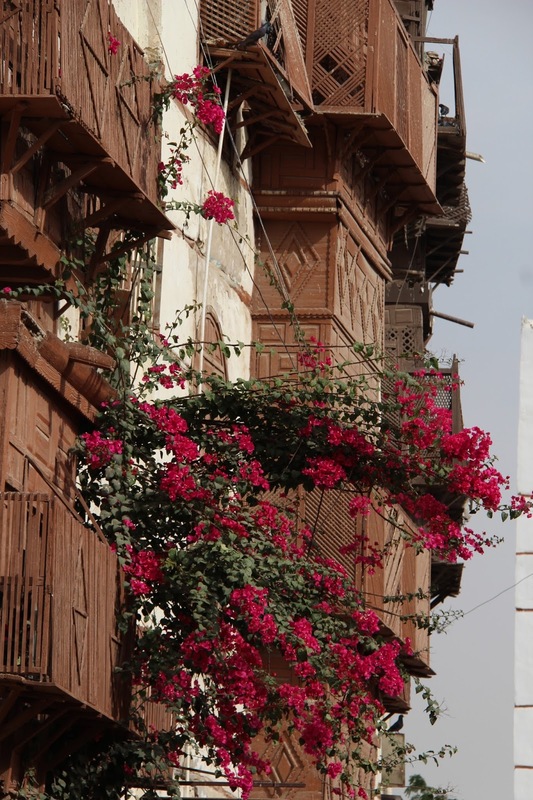 Yalla,’’ we said our goodbyes to Al Balad and clutching shopping bags, clambered aboard our van. 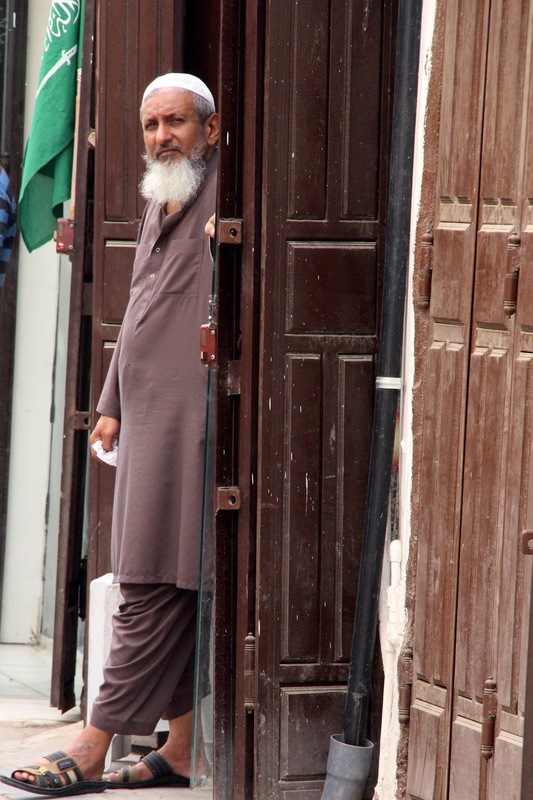 You got some great photos of Al Balad, and I enjoyed your descriptions too. Thanks, Susie. Al Balad was definitely the highlight of our time in Jeddah. What a fun walk. From the comfort of my home office, I felt none of the humidity and heat you must have tolerated without a complaint! Yes it was fun. Early morning meant that the heat wasn't really too bad, or perhaps we're just all used to it!